Now that the council has selected this alternative, the project will move into final design, which includes refining the construction plan and schedule for Option 2C. The project team will hold a number of events with the community to gather input over the coming months. Business & property owner group meetings will occur in October and an open house will occur in November. Be sure to monitor the project website for more specific dates as these events approach. The City of Rochester is in the final months of the planning stages and looking to start final design this spring for a 2019 reconstruction of Broadway Avenue (from Civic Center Drive to 13th Street North). 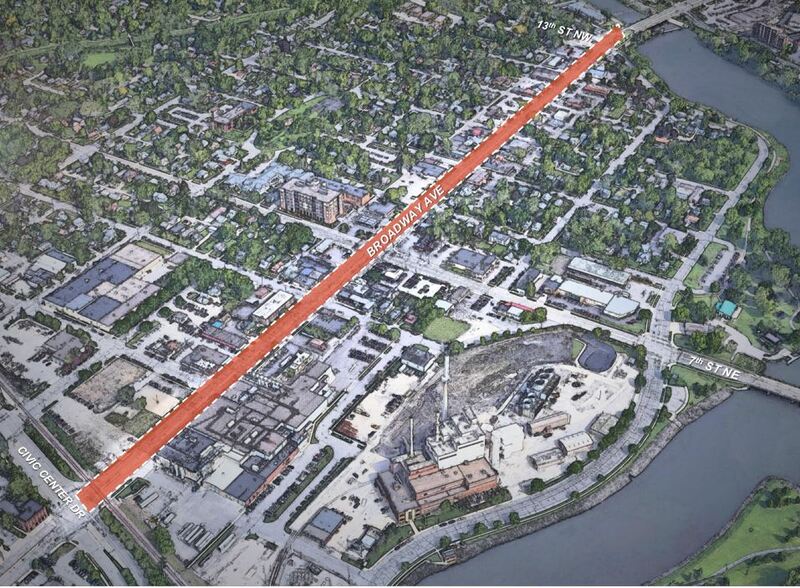 This project is intended to begin the transformation of the Broadway Avenue corridor into a significant multi-modal gateway to downtown Rochester and the Destination Medical Center (DMC) Development District. The Broadway Avenue Corridor Study, completed in 2015, set the stage for future improvements that will occur. The third project open house was held on Thursday, November 15th at 125 LIVE. At this open house, the project team shared design updates and construction phasing. Click to view the layout and board displays presented at the meeting!